VR technology has advanced by leaps and bounds over the past few years with optics and capabilities steadily improving even as hardware prices continue to decrease. Leading this revolution is the newly revealed Rift S from Oculus, the company’s first headset released in nearly three years. The Rift S is the direct descendant of the first Rift and offers a slew of improvements over the original. The S includes upgraded lenses, a fifth onboard position tracking sensor, slightly better screen resolution and some handy new software features to boot. The S weighs a touch more than the first Rift, but the new Lenovo-designed halo band does a markedly better job of balancing the headset on your noggin. The unit’s weight is more evenly distributed atop your head, rather than clinging to the front of your face using a system of straps. I’m most excited, however, by the fact that external positioning pylons are a thing of the past (with the Rift S) thanks to the addition of an inside-out tracking system, dubbed Insight. What’s more, Oculus has augmented the existing Passthrough system (now called Passthrough+) that, with the flip of a menu toggle, allows the wearer to see the physical world around them without having to take the headset off. This is a boon if you’re, say, playing a game and your phone rings. Oh, it’s a spam call? Boom, you’ve already sent it to voicemail and are back in the game within moments — no fuss, no muss. The Passthrough+ system adds another handy feature, letting users customize their own play spaces by “painting” a virtual boundary around them. This way, you won’t have to rearrange your living room ahead of every gaming session. I donned the new gear for myself ahead of GDC 2019, but unfortunately, I was only afforded a hands-off demo of this feature (in the form of a video presentation) and wasn’t able to test it for myself. Still, if it works anything like what was shown in the demo, this could prove a really handy feature. I also really appreciated the new wiring scheme. While the S does still require a hardline connection to a Windows 10 PC, the menagerie of cabling seen on the first Rift has been condensed into a single 5-meter cord. The experience doesn’t offer the same freedom of movement as the equally-priced (and simultaneously launching) wireless Oculus Quest, but the S balances that with superior graphics. The visuals are slightly better than the original. The Rift S offers resolutions of 1,280 × 1,440 per eye, compared to the Rift’s 1,080 × 1,200. Additionally, the S relies on LCD screens rather than the Rift’s OLED. This reduces the “screen door” effect and marginally increases the field of view, according to Oculus reps, but does so at the cost of slightly reduced color saturation, contrast and refresh rate (80Hz for the S, 90Hz for the OG Rift). My biggest complaint of the visual system is that, since the S uses a single screen, you can’t manually adjust the distance between the lenses (aka the IPD). There’s a software-based solution to this on the S but it’s just not quite the same as what existing Rift users have come to expect and I’m not entirely sold on it. The Rift S offers backwards compatibility with users’ existing Rift libraries but unfortunately, that doesn’t extend to the controllers. Since the original Rift used an Outside-In tracking scheme, the ring on each controller was set below the user’s hands. But with the new Inside-Out system the S uses, those rings are situated above the hands. As such, the Constellation controllers you used with the Rift are not compatible with the S and you’ll have to pick up another pair alongside the new $400 headset. I also noticed that while the lag on the S is comparable to the original, the hand and arm avatars are really twitchy — like my in-game persona has developed a slight tremor. As for audio, the Rift S’s built-in speakers operate admirably. Even in the noisy co-working space in which the demo was being held, I didn’t feel the need to plug in a secondary set of headphones into unit’s concealed 3.5mm audio jack. That said, the sound quality did turn a bit tinny as the in-game audio got louder. 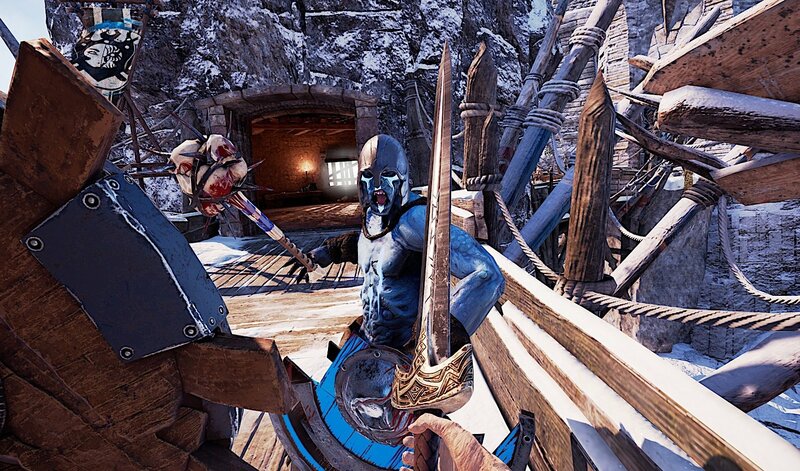 I really enjoyed playing Asgard’s Wrath, an FPRPG in the same vein as Skyrim VR, on the S. In that game, you play as a fledgeling god taken under Loki’s protection and tasked with completing various quests to grow into a full member of the saintly pantheon. The visuals on the S were clearer than I expected them to be and not that much worse than early PS4 games, the head and controller tracking was on point, and the game was honestly fun. I spent 15 minutes hacking and slashing the Kraken, slicing through thrown ships with a flaming sword, grabbing oversized leeches and squeezing the life out of them with my “bare” hands, and generally wrecking shop on a massive sea monster until it retreated into the depths. Overall, the Rift S is an impressive piece of hardware. Its resolution and clarity are leagues beyond the PSVR and noticeably better than the Quest, but only a bit improved over the original Rift. And given that the Rift S doesn’t play anything that the OG doesn’t, I’m finding it hard to justify shelling out another $400 for a new headset.